From left to right: Adam Sibol (Armstrong’s CEO), Army Miller (Armstrong’s Sales & Marketing), Tracey Smith (DKI Regional Sales Manager), Phil Colaiacomo III (Armstrong’s CEO), and Brent Pelletier (Armstrong’s General Manager). 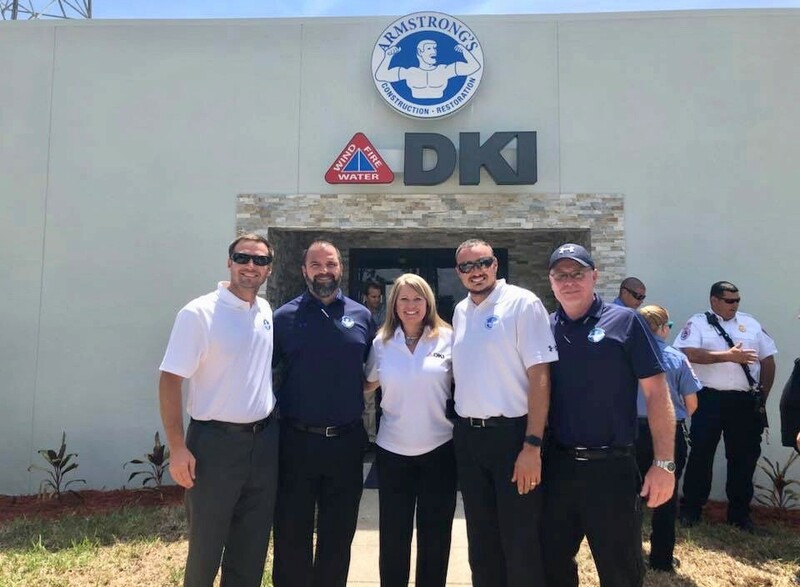 July 26, 2018 – Armstrong’s Restoration, a member company of DKI, North America’s largest disaster restoration contracting organization, proudly announced opening a new, larger location at 6525 Babcock Street in Palm Bay, FL. The ribbon cutting ceremony was held on Thursday, July 19, open to the community and with Mayor Pat Reilly, the Malabar Fire Department, Chief Mike Foley, the Brevard County sheriffs, and the Palm Bay and Cocoa Beach Chambers of Commerce in attendance. The larger space with 4,800 square feet of office space and a 2,700-square-foot warehouse accommodates their growing team and allows everyone to work more efficiently. Armstrong’s, a member company of DKI since 2013, renewed their membership this year to continue utilizing DKI’s sales and marketing support, network tools and resources, 24-hour call center, year-round trainings and workshops, and participate in their various co-op programs through DKI ProSupply. In order to be eligible to renew, Armstrong’s consistently meets DKI’s standards, which involve passing background checks, providing proper licenses, insurance minimums and certifications, and other requirements issued for all DKI member companies. “We are excited for Armstrong’s recent growth and this new milestone in their business. And, we look forward to continue this partnership,” said Charles Ebersole, DKI’s CEO. Armstrong’s Restoration is a family owned restoration and construction company located in Palm Bay/ Melbourne, FL with over 26 years of experience. Available 24 hours a day, 365 days a year, they can be reached any time at 321-729-8049.